This month I was lucky enough to be invited to a cooking class with Terresa of La Cucina di Terresa, She is a Californian who has been living in Europe, soaking up the wisdom of French and Italian cooks and farmers and giving cooking classes and tours. 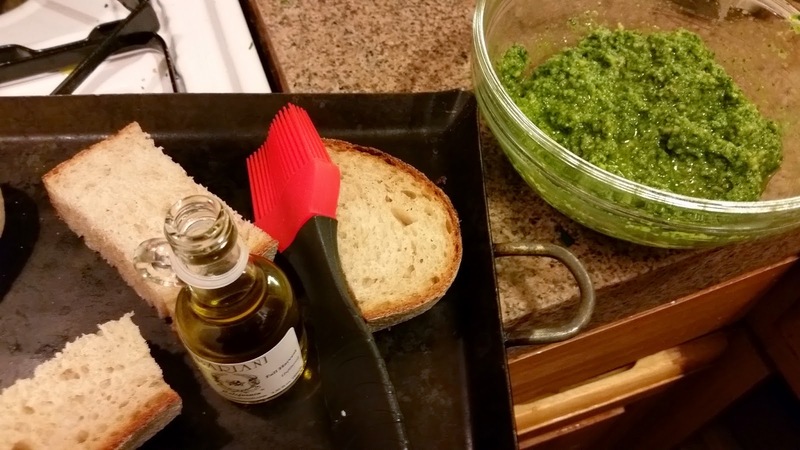 While we were waiting for the things we were working on to come out of the oven, she shared the most amazing herb and carrot-top pesto with us. Here is my attempt at it (the recipe makes enough for 20-25 bruschetta). 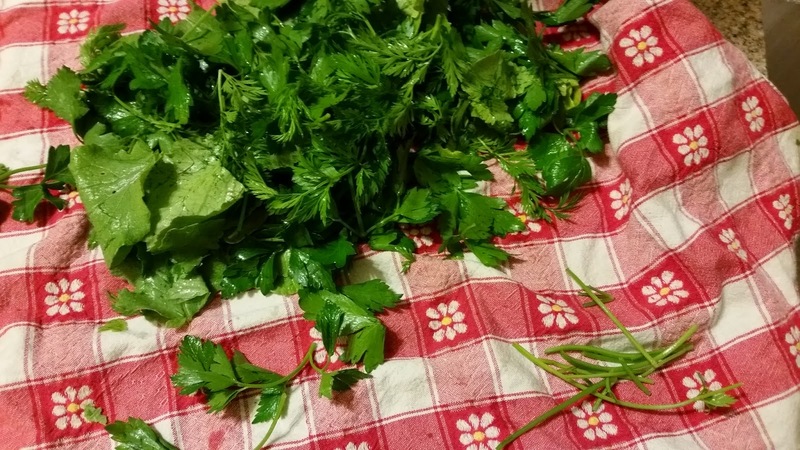 You could use all herbs: parsley, basil, cilantro, whatever you love. 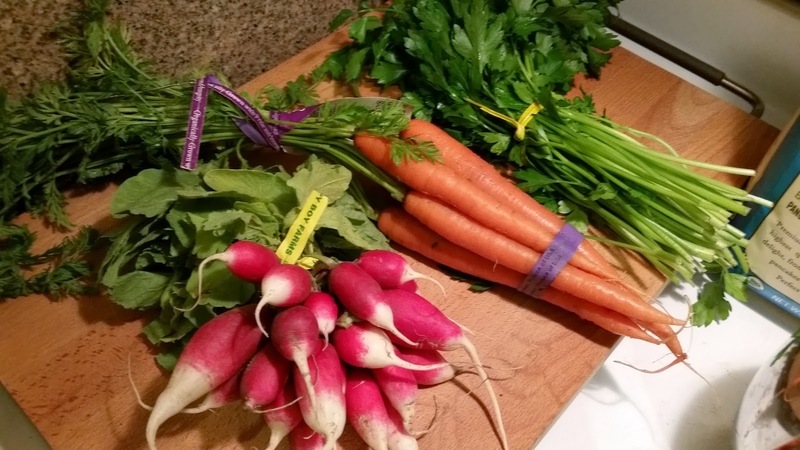 The best reminder I got out of the class was the reminder of how important it is to get the freshest ingredients grown with the most care, and the best new information was how delicious carrot tops, radish tops and beet tops can be! Alas, beet tops usually come attached to beets, but I'll definitely be using more carrot and radish tops. She also took the mystery and scariness out of cooking by weight rather than by measuring cup. 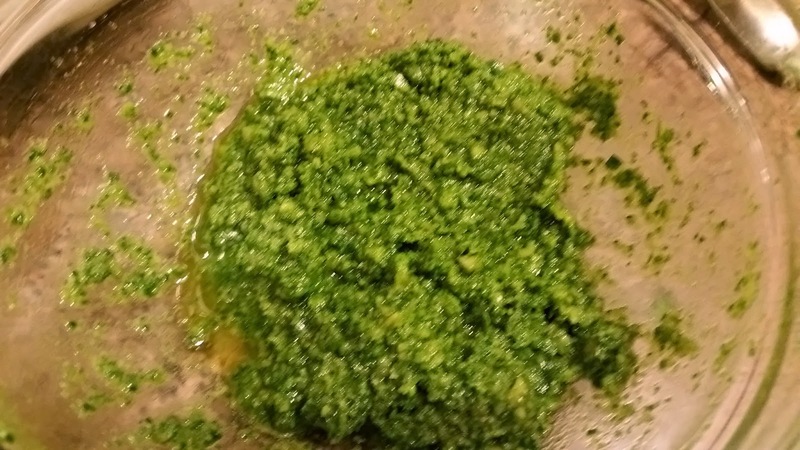 This pesto is actually made by a ratio by weight, one part herbs, one part seeds or nuts, one part cheese, one and a half parts oil. I'll provide approximate cup measures, too. Here are the greens I used: parsley and the tops of carrots and radishes grown nearby with care. Radishes are in season here in Northern CA right now, so there are several varieties available at the good markets and farmers' markets. The rest will go into soups and salads in the next day or two. 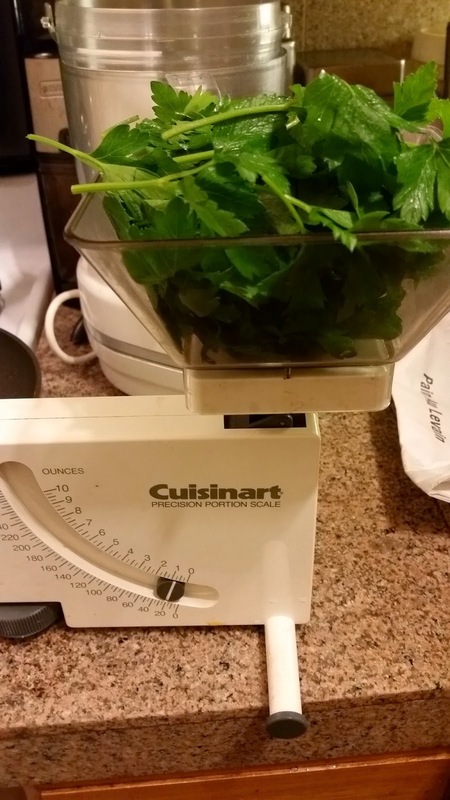 I weighed out 50 grams of greens (this came out to a little over 4 cups packed loosely). Wash the greens well. These lovelies weren't power washed at the mega farm, so they had quite a bit of dirt on them! Spin them dry if you have a spinner, or pat them with a towel. Spread them out on a dish towel to dry more while you grate the cheese and prepare the other ingredients. Remove the thicker parts of the stems. The small parts are fine to add with the leaves. Grate 50 grams Parmigiano Reggiano (about 1.5 cups). 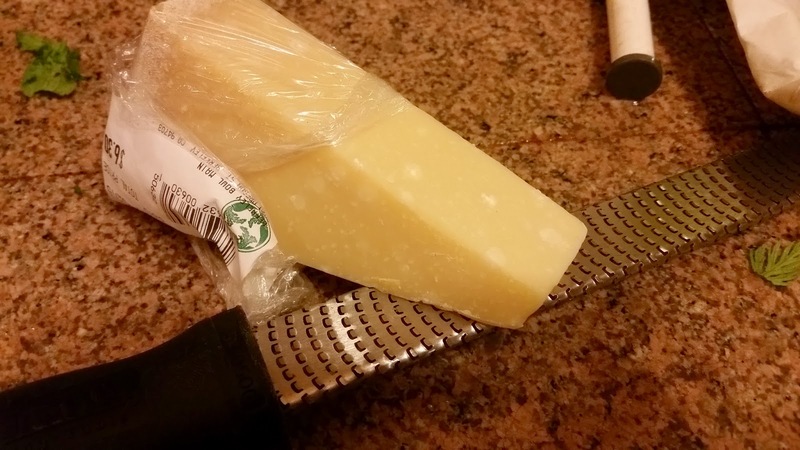 If you don't want to splurge on Reggiano, you can use a cheaper cheese, but don't buy it pre-grated, please. Pretty please?! It'll already have lost half the flavor. 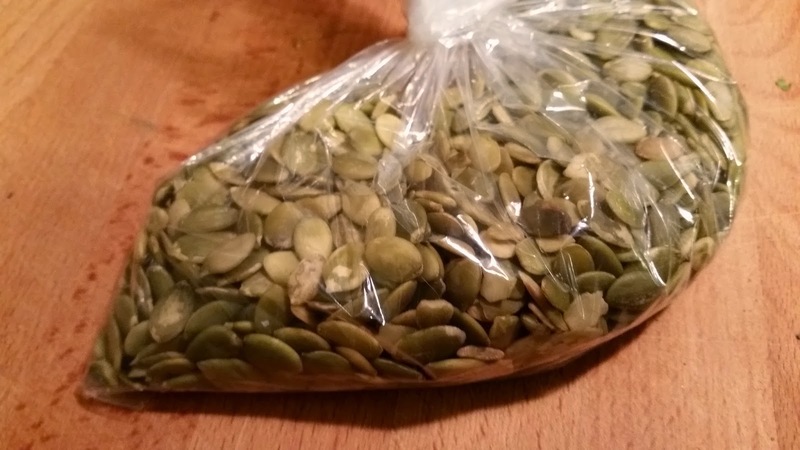 Weigh out 50 grams of pumpkin seeds (maybe 1/3 to 1/2 a cup). You could also use pine nuts, but today at the market they were $21.99 a pound vs. $4.99 for the pumpkin seeds. Walnuts, almonds, whatever you like could work. Don't toast them for the pesto. But do toast the leftover pumpkin seeds for snacks and sprinkle them with a little salt. Delicious. 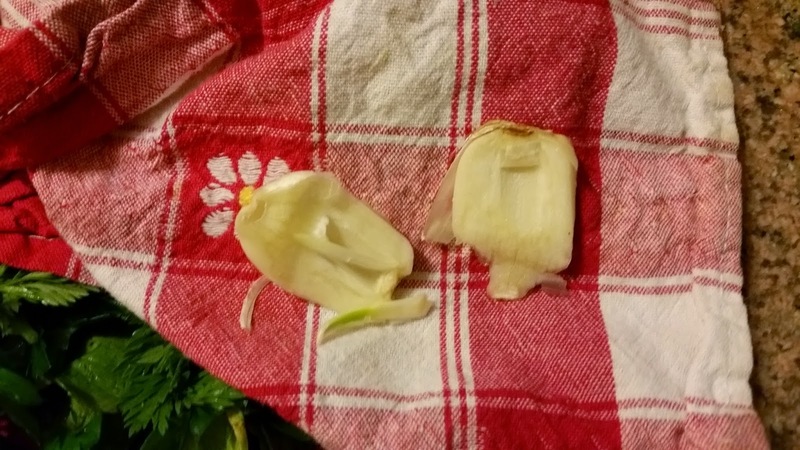 Here's another tip from Terresa: peel a garlic clove, then slice it in half and remove the greenish root from the middle. If the garlic is super new it might not have one, but usually it will. Mash 1/2 of the garlic clove with a pinch of salt (with a mortar and pestle if you have them, a fork and a bowl if you don't), Set the other half aside for the bruschetta. Put the seeds in a food processor and pulse a little bit to chop them up. Add the mashed garlic and herbs. Pulse a little more, stop and scrape down the sides, and then add 75 grams of really good olive oil (about 1/3 cup). Turn on food processor and blend just a minute or so. When it looks nice and evenly chopped, turn out the pesto into a bowl and stir in the cheese with a spatula or a spoon. If it seems thicker than you like, you can stir in a little more olive oil. Let the flavors come together for an hour or so before serving if you can wait. I couldn't today! baguette. Terresa brought bread from The Mill, the fabulous new bakery in SF where people stand in line for-e-ver for a slice of $4 toast. I have to say, it was really good. 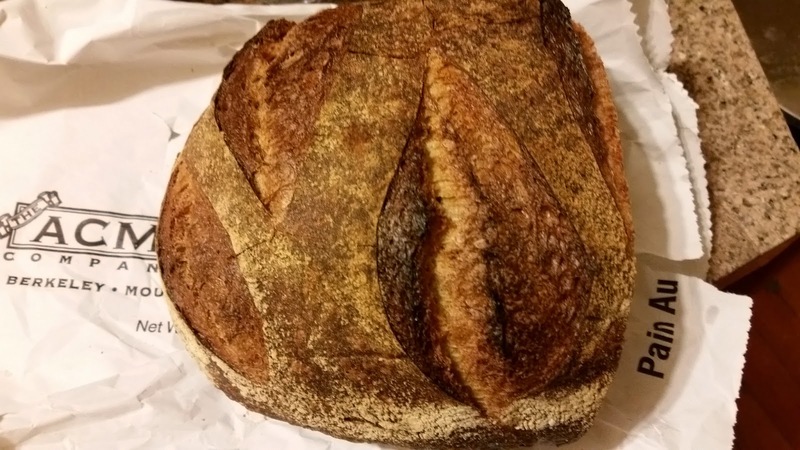 That wasn't in my schedule this week, though, so I got the Berkeley classic: Acme Pain au Levain. 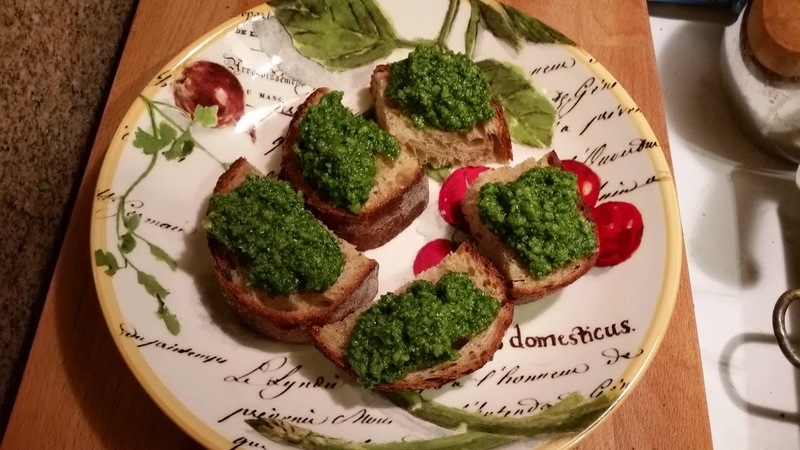 Slice the bread into nice size pieces to balance with a hearty spoonful of the pesto. Pre-heat the oven to 350 and get some olive oil and a pastry brush ready for when they come out. This is Bariani olive oil, available at farmers' markets, good supermarkets and health food stores. 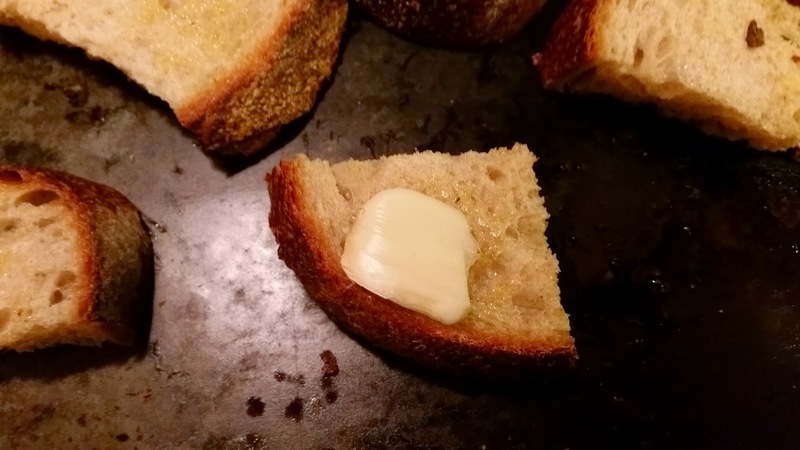 Toast the bread in the oven for a couple of minutes, turning over halfway through. When the bread is nicely toasted (somehow the toasty color doesn't show here, but you know what toasted is, right? ), rub the second half of the garlic clove on one side and liberally brush with olive oil. 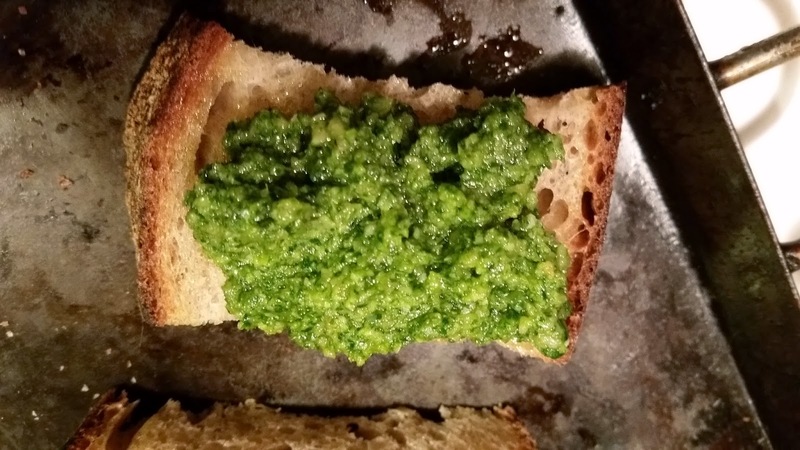 Spoon on enough pesto to have a nice balance between the bread and the topping. Serve on something pretty and enjoy!